First and foremost I would describe myself as a painter even though I have worked, and still work, with many other mediums on quite a regular basis, for example video and photography, but I see painting as the backbone of my practice and that informs everything I do. The bulk of my work over the past few years has been using found images and photographs mostly sourced from the internet which are treated to very systematic translations into paintings. 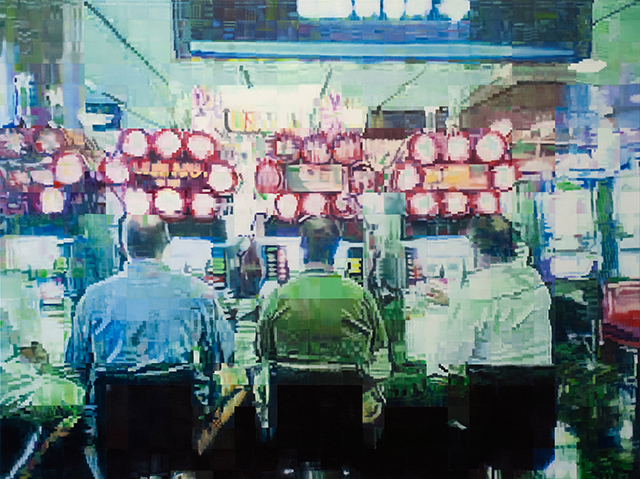 An ongoing interest for me has been in exploring the digital aesthetic, complete with pixelation, errors and glitches. This comes partly out of an interest in the hidden structure underlying digital images and partly from a love of the purely abstract qualities of this visual noise. I tend to always gravitate towards images which at first glance seem inconsequential, maybe even coming from amateur sources, images which otherwise would be lost and easily forgotten in the perpetually growing stream of online media. Up until recently most of the images that I have been using have been very much from the present day, pictures of contemporary life, but currently I am looking to images, videos and photos that are dating back to the early 1970s. My background is in computer programming, which I studied for a few years before art and, although I tried to avoid it, the mathematics and structured logic from that world eventually began to invade the way I approached painting and making art. Over the years I worked professionally teaching multimedia applications and as a video editor, a web designer, and programmer, so I think there is no way for me to avoid dealing with the digital world and the technology in a very direct way. Added to that I have always been fascinated by watching the evolution of digital technology and the internet. In particular by how our relationship with photography, video and images has changed so drastically in such a short period of time. 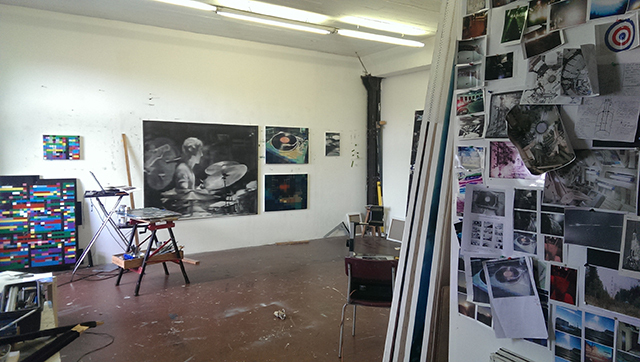 My day in the studio usually it starts out slowly by tidying up the remnants from the previous day’s work and I also spending a lot of time just looking and thinking and assessing the success or failure of what I have been working on. Often I’ll spend some time writing, just notes really or rambling reflections on what I am working at the time or more often what direction I would like to go with the work, trying to figure out all the dilemmas and understand or define my own place or position in it all. I often think about that movie, from the 80’s I think, called New York Stories, it was in 3 or 4 different parts, each one by a different director, like Scorsese and Woody Allen. Well there was one segment in the film which had Nick Nolte playing an artist. I don’t remember who directed that bit and I can’t even remember the story very well but there is a scene from it that that has stuck with me, the scene of the artist in his studio painting. It had loud dramatic music, he was drinking whiskey, smoking cigarettes, caught up in the moment, in a vast studio, making wild expressionistic gestures, the whole thing was full of gravitas, angst and that horribly misunderstood and over used word “inspiration”. Well my day in the studio is nothing like that. But for a long time, while growing up, that is the picture I had of the romantic idea of the artist working and maybe for some people that is how it is. I do have the music on and I try to keep the music suitably dramatic and loud, and I do get lost in the moment, in the flow, while working, but actually my time in the studio is generally quite structured and planned out and my working process goes through different stages from research to experimentation, planning on to preparation, then to the actual painting and a lot of time spent quietly looking. A friend of mine back when we were in art college used to have days that he would set aside that he would devote to spontaneous unplanned experimentation in the studio, his spontaneous days as he used to call them. Well I do sometimes following his example take a few days every now and again for my own spontaneous days or I guess I could call them my Nick Nolte days. I find myself doing a lot logistical planning, mostly organising transportation for exhibitions. It is something that I have had to learn about the hard way by just doing it and I don’t think I ever envisioned the amount of applications, proposals and submissions that an artist has to make these days. It is definitely one of the things which strips away any of the romantic clichés normally associated with being an artist. A necessary evil maybe but it can be like playing the lottery at times. I think I have managed over the years to get a good balance to it and the make sure that it doesn’t take too much time away from the actual art making or that the art making depends on the outcome in anyway for funding or support. Something that has been very rewarding to me is any time that I have spend teaching in art colleges. It is not something that I do on a very regular basis at the moment, just intermittently as visiting artist but it has always been very fruitful experience. Also over the past few years I have organised and curated a number of group exhibitions which has likewise been hugely rewarding and a great learning experience while at the same time allowing me to work with and get to know some great artists. I mostly work in the studio on weekdays and my typical day begins around 9 or 10 in the morning and runs to about 5 or 6 in the evening. So in that way, time-wise, my artistic practice is almost like a regular 9 to 5 job. I have three children so my work revolves around the regular school hours. The number of days I get to the studio varies depending on other work that I have going on but I try to get there as many days as possible each week. I often work late into the night at home on research or if I need to do any preparatory work on computer. Of course when I have a deadline for a show coming up my time and days in the studio tends to run a lot longer but for me the regular structure and discipline of going to the studio for such regular hours has been really helpful in maintaining a certain amount of sanity in my life and as a result sustaining a career over time. I am not one for sitting around waiting for ideas or inspiration to come, instead I for me ideas come very readily as a result of the process of working and often actually from the little things, the seemingly meaningless but necessary tasks that go on around the work. The scale of my work has increased over the past five years and I have been exploring different materials and techniques but I think one of the main developments in my work has been that I have made a conscious effort to expand the focus of my work, in other words allowing myself to follow different tangents or different parallel strands of interest at the same time rather than trying, as I had done previously, to restrict myself to a more singular path in an attempt to establish a distinct style. This has been a very liberating development for me and one which I hope to push further over the next few years. I would say is one of the greatest ongoing challenges in my practice is with the selection of source material. It is a question I find myself returning to again and again in attempt to find a strategy that could act as a guide or at the very least a framework to my choices. I imagine that it is a challenge that most artists must face when presented with all the possible images, themes and subjects that are on offer from the internet, when you can choose from everything it is hard to choose anything and every choice is valid but then also invalid. Navigating and selecting from these possibilities is never easy and my own approach is continually evolving. When I first began using the internet as a source the selections were semi-random or quite arbitrary in nature. Most recently I have begun working on a project that is looking at media and subject matter guided and directed by research into and around newspaper stories about UFO sightings. I’ve had a studio for the past 8 or 9 years in a former piano factory which is home to almost 35 artists and the daily interaction with the other artists in the studio house has been a very valuable thing for me and it continues to be a rich source of support. I have been very lucky over the years to have had quite a number of close friends who are also artists that have been great companions to discuss, debate, argue and pontificate at great length about art and I think this has been a huge influence on my work and my approach. Living in Berlin means that I have easy access to a vast number of galleries and museums and I spend a lot of time visiting galleries and looking at art and I could make a vary long list of artists who’s work has influenced me in some way or other both directly or indirectly. Some of the main artist that have always been on my radar would be Richard Hamilton, Malcolm Morley, Gerhard Richter, Sigmar Polke, Shirin Neshat, Eberhard Havekost and Xie Nanxing to name but a few. Music, film and books have always had a very great influence on my work and my taste in all of these areas tends to be very varied and eclectic but a list of those names would be very long. Recently I have been listening to a lot of the weird and wonderful Moondog, watching the movie Holy Motors a couple of times and reading a strangely fantastic book called Wittenstein’s Mistress by David Markson. I think I would be a baker, baking bread just seems like a very useful thing to do. 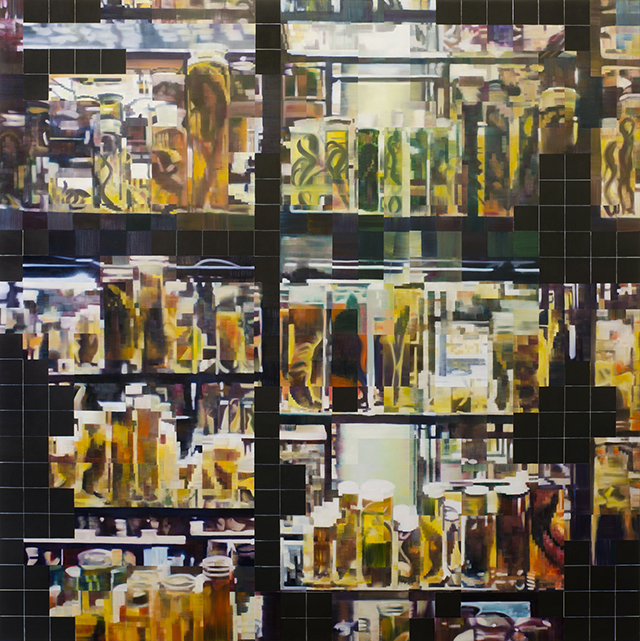 Enda O’Donoghue’s work presents a forensic interest into the construction, the language and the mediated world of digital images together with an ongoing dialogue with the medium and process of painting. Hovering between the realms of abstraction and representation, between the mathematical encoded and the organic, O’Donoghue’s paintings are the result of a process which is highly analytical and methodical and yet inviting of errors, misalignments and glitches. The imagery comes almost exclusively from found photographs sourced from the Internet, where he plays with random throw-away moments of everyday life, merging them together in various interconnected themes. In O’Donoghue’s work, the painterliness of his technique works with the disposable nature of his subjects to make the work sometimes poignant and melancholic, or alternatively brittle and harsh. His work is deeply influenced by the digital high speed reality we now live in and he transports these seemingly meaningless sound-bite images from a place of apparent futility to one that questions and searches for meaning through the transformative act of painting. Enda O’Donoghue was born in Ireland in 1973 and has been living and working in Berlin since 2002. He completed a degree in painting at the Limerick School of Art and Design followed by a Masters in Interactive Media at the University of Limerick. O’Donoghue has taken part in numerous international group exhibitions, including shows at Liebkranz Galerie, Berlin (2012), Meter Room, Coventry (2012), The Moscow Museum of Modern Art (2011), Expo in Shanghai (2010), Universal Cube, Leipzig (2008), Four Gallery, Dublin (2006), Overgaden, Institute for Contemporary Art, Copenhagen (2006) and a number of solo shows in Berlin, Ireland and in 2009 a solo exhibition in New York. 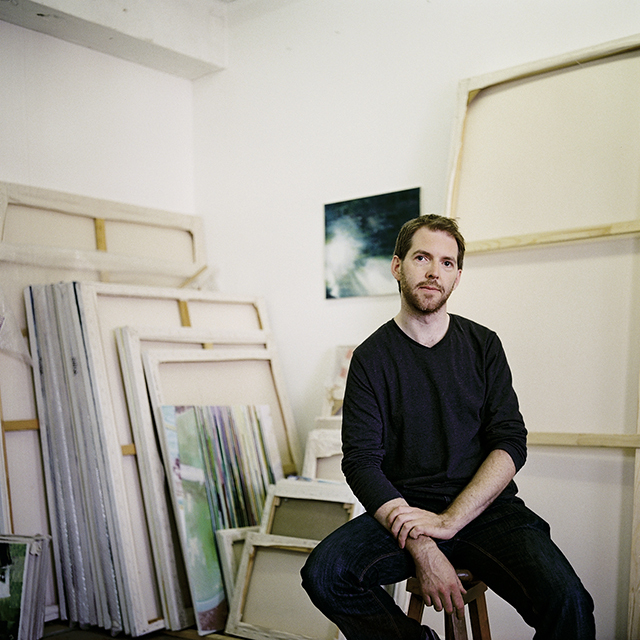 In 2012 his work was presented in a major solo exhibition at the Limerick City Gallery of Art, Ireland and he has recently been awarded a residency at the Golden Art Foundation in New York state. He has also curated a number of group exhibitions, most recently an exhibition presenting a selection of Berlin based Irish artists at Grimmmuseum in Berlin which toured to the Galway Arts Centre, Ireland in 2013. 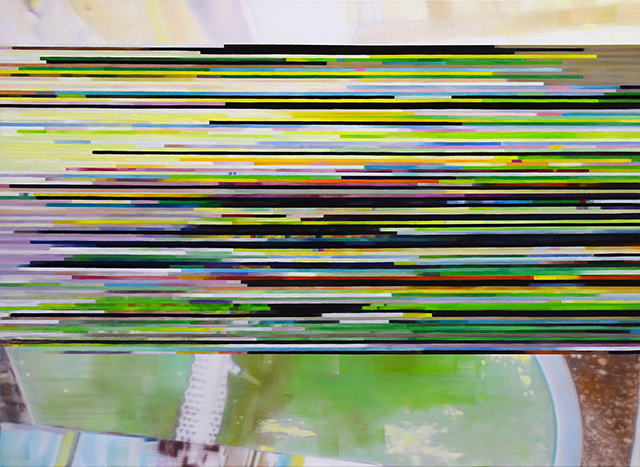 This entry was posted in Uncategorized and tagged Berlin, Digital, glitch, Painting, photography. Bookmark the permalink.